Gary The Gadget Guy or "G" is pretty easy to find. Club Penguin finally figured out that all us penguins will be mad if we can't find the Famous Penguins. So ya, they made Gary easy to find..
HEY MIMO, WHAT ROOMS CAN YOU FIND GARY? He Starts at the Underground Pool, then may go to the Plaza and then the balloon at the Forest. Then goes to The Tallest Mountain. HEY MIMO, WHAT SERVERS CAN YOU FIND GARY? First, he is not always on busy servers. He is a shy nerd remember? ;-] We have found him on servers with only a couple of marks on the server. We have found him a lot! MEY MIMO, HOW LONG DOES HE STAY ON A SERVER? HEY MIMO, HOW DID YOU FIND HIM SO MANY TIMES? Uh, The Mimo Comment Tracker! It works! Use it! HEY MIMO, HOW DO YOU MAKE THE BALLOON TRIP GO FASTER? The Ballon trip is slow sometimes and faster other times. If you untie the sand bags on the balloon it should make you go faster but sometimes it doesn't because the clock will start. You can't untie the bags until you get off the ground. We got there in 3 seconds one time! And can anyone prove that there is more than one Gary? New Mimo Aqua Party Clue coming today! that's cool, thx mimo. he is a shy nerd...lol. My cousin found Gary on the server Blizzard a day or two ago. Before you take the Ride, press the + Key in your Computer Keybord. Thats the way to get faster, many of you say: “Its just the same!” but being honest it goes faster and sometimes it reduces the time! its just awesome ! Hmm, maybe. I will have to check it out and see! Thanks for the cheat dude! I'll have to test it out! The only famous penguin i found was Candence ive been in the same room as rockhopper but i did not notice it until he left! how do you access the mimo tracker? Ok, I think I have figured a few things out. Yesterday, when I found Gary, he was on Fjord. But also at the same time,on trackers, he was at husky, I logged on Husky and he was there also! So apperently he can be on more than one server at a time for people to meet him! Mimo said hes not a member anymore how does he go on the baloon ride? I think I figured something else out too. When you enter the balloon, it always says 5 seconds until launch right? Well, when other penguins get there before you do, they would already be flying above cp. It depends how long it takes on how long the first person has been there, because if they have been there for a while it would be a shorter time for you, and if they just got on it will be a longer time. Unfortunately, my membership expired the day after the party started. I was on the first day, and would have been the night before at 9:30, but i hadn't been paying attention to the date of the party, as i usually do... hence i'm usually there the minute it starts, at 9:30, not 9:00, which some people think. But not this time, sadly. I was still able to do the balloon ride and get the jet pack, but membership expired the next day. I haven't found gary, but since he's been found in other places - my cousin found him in the pool - i might still have a chance! Because there is less weight! awsome! i got lucky friday! i was on Parka on an adventure with my buddy Gamewizard7 at the cove when someone yelled "GARY AT THE POOL!!" I, of course, got there ASAP. (As Soon As Possible) There he was! I got there just in time, he was about to leave! Keep on Wadell-ing! GET INTO THE MIMO SPIRT! sorry. its just more fun and when he does clues, not as many ppl show up cause he makes hard clues. If you see a server that has about 4 or 5 Green lines on it and it usually has about 3 or 2, then there's a big possibility that Gary can be there. Hey mimo im so happy! I have now met every famous penguin! After reading this, i logged onto club penguin and tried it. I'm sorry to say this, but that cheat doesnt work. usually if he is on the tallest mountain and a non-member friend wants to meet him, you can ask him to go the pool and he will. Sweet, right? He has parties called quickee parties where he just announces the details on his twitter, nd you go meet him. THey are alot of fun and usually not as big as regular clue parties, so you can talk with Mimo without a huge crowd. Magic. Or he goes on one of his siblings members penguins and edits his penguin into the picture. anyone know ware he is now?and can some one search with me? The baloon will get quicker when you take off the sandbags because the sandbags make it heavier, so then it will go slower if they are left on. Monchocho thanks for the tip it realy works! It's pretty simple! You just click on comments and see which comment has the closest time to when it is now. Then log on CP and try to find Gary!!! mimo! i have proof of more than one gary. 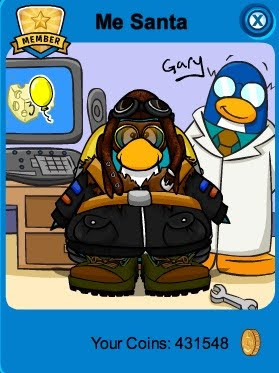 My freind and I were on Club Penguin and I found Gary at The TAllest Mountain on Fjord. While my friend found him at the Hot Air Baloon on Mammoth. Our names are Trainz Railz and Pikachu 7526. How do I get to hte mimo comment tracker? You cant make the balloon go faster it has to land at the same time for everyone so if you get on when the balloon is about to land you'll have a very short ride on the balloon. Although u can drop sand bags and pull handles and tturn stuff it doesnt make it faster. I went in the balloon with 10 people and it took 11 seconds but when I went on it and there were almost 80 people it took about 38 seconds , so I think it is depending on the number of penguins that are on it! soz 4 not commenting in a while again. ill catch up. Did you join the flight right before it landed so that when you got on there was hardly any time left? It's ok. I heard what happened. I'm incredibly sorry. I SAW SAAVY! Saavy was on frozen and was talking to another penguin. I probably asked him about 2 million times to be my buddy but he always said no. Saavy, if you remember me i'm Jwolly76. Ya I can prove there is more than one Gary. one time he was in Slushy and Snow Shoe at the same time. I logged off Slushy with Gary still chatting to us and went to Snow Shoe and lo and behold, Gary. Actually,Gary usually goes to a random server and starts skipping a few.He has a pattern of it,nobody actually knows the real pattern. When u get on the balloon its usually just five seconds till it flies or 30 seconds cuz each person that gets on the balloon is departing.Hope this helps! Look a post down that's titled Mimo's Comment Tracker or something close to that. You look at the comments and people will tell you where he is! who knows how many garyys are on? He snuck into the room. Mimo is a spy! AWESOME AWESOME AWESOME!I love ur website! :D You should have another wheres mimo contest and the first wiener gets ummm...a cp coin code! It makes you go faster because there is less weight, and when the sand bags are on it, it is to steady the balance, and to make sure it won't leave the ground too fast too. I kind of agree. Everybody's Internet is not fast so it's really not going to land the same time period with everyone else's computer. Scroll down a post that's titled Mimo's Comment Tracker! Look at the comments people tell you where G is! Those are known as Quickee Parties. If Mimo just gave us all the clues the server would be packed like crazy! I found out you can untie the bags when the bollon is in the air. It goes faster because it doesnt have as much waight. They carry bags of sand! Its wierd i just looked it up! Thanks mimo!!!!! Gary goes on 2 servers at the same time and idk why and unting the sandbags it lets you go faster since the ballon wont weigh too much. Removing the sand bags on the ballon reduces the weight of the ballon, which makes able to go faster. You just look at the comments. I hope u find gary. I hope i find gary too. Thankz for the tips Matt! i know how you got there so fast! you changed the time on your computer! I KNOW HOW YOU DO IT! You take a zebra, Carl and a donut (for company), take the fire from the cove, put it on the balloon and off you go! You'll get there super fast! "Hey, where'd the f-fire go? I'M F-F-F-FRE-EZING!!!" Hmm... maybe not my best idea. Hehe. how do you "untie" the sand bags? does anyone know where any of the people are?? You look at people's comments and they'll tell you where G is! You look down a post that's titled "Club Penguin Gary The Gadget Mimo Comment Tracker!" The next Aqua Party clue will be announced soon today! We just have to have patience for it! Scroll down a post to the Mimo Comment Tracker and look at the comments to know where Gary's nearest location is at! Hey,Mimo! If you go in the mine and click the light blubs on the celing.The'll flick'er of and on! i know how you get there fast! you get have to arrive with the people already on there so if they have three seconds to land than when you get on you have three too! One time I was at the forest and Gary was there too so gary went on the balloon ride and all of a sudden he got off and he was at the tallest mountain! lol the day u said u could find Gary, i found him!!! Nope! :-/ But the Tallest mountain and the balloon ride kinda make up for it. ive been searching him all day! because the baloon is lighter? It Depends on what time you get onto the your shuttle as every 30 seconds a different shuttle goes off that means that all of you are on the same trip. Mimo I got it! See.. we got to a great height slower with weight on the bolloon. If we relise the weight it will make us go up! See there is no t at the end of light and it's the same with: Snow Covered, and Southern Light. just want to tell you! The day the party ends! LOL. No, but there is a balloon ride and the tallest mountain. Yah, I think you are right. Im personally giving you credit. LOL. Hey Mimo! For your imformation Gary is not a shy nerd. He is smart and quite shy but that doesn't mean you can go and insult him. okay guess what?? these severs are actually cut off because their name are so long they don't fit in the oval-thingy. and umm it's Northern Lights and Southern Lights not Northern Light and Southern Light. Thaks for the help. I found him the other day. Yahoo! Grrrrrr... please someone find G! I want to find him i've only found Rockhopper and thats it!!! I met G at the penguin play awards. i was wonderin how do u become a cpg mod? I think I know how you got to the tallest mountain in three seconds. You got on the balloon ride when it was about to land, which the the distance time. I noticed that many people appeared in the air balloon in mid-flight and how do you get no other way but by going into it. I don't know if this is right, but when I clicked the red tanks with the wheels on top, before take off and kept clicking them until I could untie the bags, then I got there ion a much faster time. at the end of all your answers to questions, BUT ONLY THE ANSWERS. Gary stays in one place for 15 minutes and i found him mostly on the first three servers... HES AWESOME!!! Hey umm dude. I am 9rjjacob9 on CP and i know y you go faster without the sandbags. (great cheat i didnt know it.) it takes off the weight of the baloon. oh yeah and they put it on to keep the baloon on the ground. P.S. The bags are filled with sand. i'm on flurry but i dunno about "BALLOON" cuz i don't have membership.you mean balloon ride? :] Rock on Mimo!!!!!!!!!!! u need to be a member to find gary?? ind him in deep freeze,but my friend,King hei find him in fjord at the same time! Sorry, it should say "which cut the distance time." Well, the sandbags weigh the balloon down and the wind doesnt get to push it fast, But when the sandbags are off the balloon, it soars higher and the wind is able to push it faster. 1st- because sand is so heavy, and there is so much, you would get there faster, or because u had 3 seconds left . and u jumped. I don't think that the untied sandbags make it go faster. Or the wheels to the gas tanks or anything. My hypothesis is that those things just keep you occupied from the clock for the time being. So it looks like your going faster but your really not. The ballon goes faster without the sand bags because it's lighter without them and they are normaly used for keeping it on the ground. So there you have it! Gary is on Yukon underground pool! umm ok ............ it worked!!!!!! LOL me santa! The two of us has the same money! COOL! Ive Seen Gary But I Thought It Was A CutOut?? very cool,hey mimo how do you make you own web page for cheats?,me and my mte wanna make our own!!! Hey Mimi. I always use Ure tips when I need them but I always look for pins on the Cheats, Where is the pin cheat??? i got there in 1 sec!